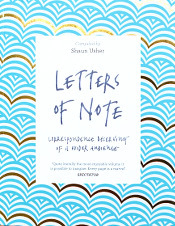 Letters of Note: You are the future. You can make a difference. You are the future. You can make a difference. 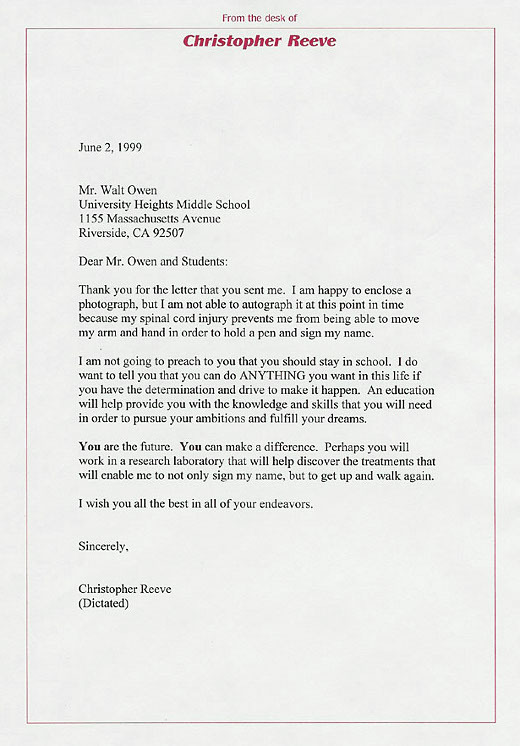 Christopher Reeve graciously sent this touching letter of advice to students at University Heights Middle School, California, in 1999, in response to a request for some inspirational words by their teacher, Walt Owen. It was dictated four years after the tragic accident that left the Superman star in a wheelchair for the rest of his life. Reeve passed away exactly seven years ago, aged 52. Transcript follows. Image courtesy of Walt Owen. 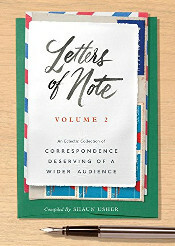 Thank you for the letter that you sent me. I am happy to enclose a photograph, but I am unable to autograph it at this point in time because my spinal cord injury prevents me from being able to move my arm and hand in order to hold a pen and sign my name. I am not going to preach to you that you should stay in school. I do want to tell you that you can do ANYTHING you want in this life if you have the determination and drive to make it happen. An education will help provide you with the knowledge and skills that you will need in order to pursue your ambitions and fulfill your dreams. You are the future. You can make a difference. Perhaps you will work in a research laboratory that will help discover the treatments that will enable me to not only sign my name, but to get up and walk again. I wish you all the best in all of your endavors.